TABARÉ VÁZQUEZ, President of Uruguay, recalling the shock of world opinion weeks ago over the image of a Syrian boy on the beach where he had died as he tried to find protection from conflict, said decisive action was needed from the world community to find solutions to the tragedies causing human migration. Prevention was better than cure, he said. What was needed was to “recognize other people as ourselves and protect all their rights”, to see democracy as a form of government that allowed people to be full citizens and to protect the planet, the only one where people could survive. It also meant preventing terrorism and discrimination wherever it appeared and to think and act boldly for future generations. As a practicing doctor until recently, he called public health a central component of national sovereignty and “an unavoidable responsibility of States”. The global burden of morbidity was moving from infectious to chronic non-communicable diseases, which were preventable. Cardio- and cerebro-vascular disease was the major cause of death around the world. Some 60 per cent of morbidity globally was due to cardio-vascular disease, cancer and other non-communicable diseases, which had no borders. Coordinated policies were needed to address poverty, promote healthy lifestyles, physical activity, sport and a healthy diet, as well as to control smoking, alcoholism, and drug abuse. He said that smoking was a disease transmitted by the multinational tobacco industry, which killed its own customers in a quest to double profits. Human and financial resources were needed to combat its transmission, which required ethical and political will. It was unethical that tribunals of multinationals were able to make trade a priority over health. Uruguay was facing difficulties with a major tobacco producer because it had made the issue a priority with the World Health Organization (WHO). The country was being made an example to prevent others from taking action. Hailing the resumption of diplomatic relations between Cuba and the United States, he said a key element to success was ending the embargo. 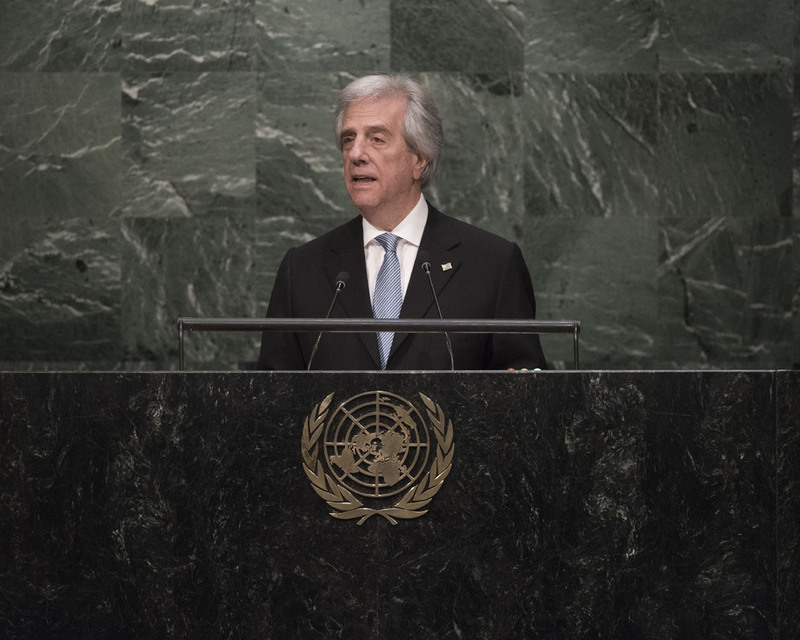 Uruguay would vote in the General Assembly to do so as it had for many years, he said, adding, “Let’s hope that this is the last time the United Nations will have to take up this issue.” He also called upon Colombia and Venezuela to peaceably resolve their border dispute and expressed support for the peace process within Colombia. He recalled that, in 2008, Uruguay had presented its candidacy for non-permanent membership on the Security Council for the period 2016-2017. The country was a founding Member of the United Nations, and believed that the only way for the Council to fulfil its mandate was on the basis of the Charter. Uruguay was committed to peace before the Organization’s founding. It was also a peace-contributing country and, as such, would like to bring its experience to the Council. It requested support for its candidacy.